WATERPROOF – Waterproof IP67. The smart bracelet that can be immersed in water for up to 60 minutes at a time. You can wear it freely to washing face, taking a bath (Temperature ≤ 50℃), swimming (≤ 10 M). BLOOD PRESSURE MEASURE – Smart blood pressure monitor measure your Systolic, Diastolic blood pressure after sports or in daily life and show the history records by date. HEART RATE MONITOR – newest HR sensor adopted for accurate and effective heart rate monitoring. 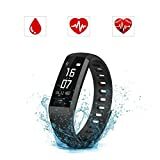 24-hour real time heart rate monitor with HR chart make your fitness conditions visual on Health. SNS / INCOMEING CALL – With a 0.96-inch touch screen, timely vibration to remind you to see messages or calls. Never miss the available business. It can sync social app notifications, like whatsapp, facebook, and so on. APP & COMPATIBILITY – Download and install the free APP “FitCloud” from Google Play or Apple App Store. App supports most smart phones with Bluetooth 4.0 or above (not for tablet). Support system: iOS 7.1 or above (not for iPad), Android 4.4 or above. ★ Doesn’t support any Windows Phone. You are about to go out, but you can not find your cell phone! Do not worry! Simply long press the Find Phone on the screen. Your phone will vibrate or send out audible sound signal. It will vibrate to alert you if your phone receives a phone call, SMS text and SNS messages including Facebook, QQ, WhatsApp, Messenger, etc. 1. First open Bluetooth on your smartphone. 2. Open the “FitCloud” App you downloaded in Google Play or App store, enter “Setting” interface. Then connect bluetooth via the name of your smart bracelet. ★ if you are allergic to a metal or leather material, please dont order it. ★ Be sure to keep the body relax when blood pressure monitor. If the wrist with the heart of the same height, the measurement data will be more accurate.